This is Radio Free Asia broadcasting in Khmer. We welcome you from the studio in the Washington D.C., the United States of America! From the Washington D.C., I, Mao Sotheany, welcome all our dear listeners. Today is August 1, 2014. 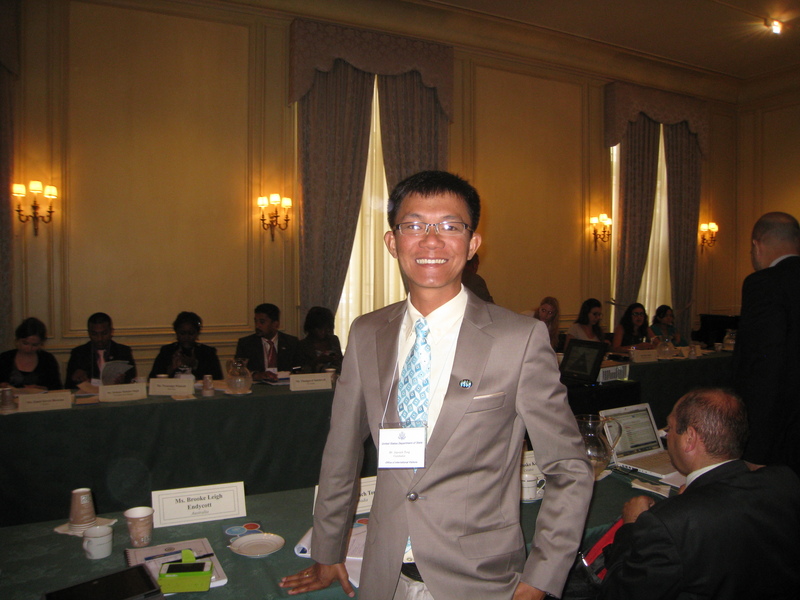 For today’s interview, we have a guess Mr. Tong Soprach, the social analyst and columnist of The Phnom Penh Post as well as the only Cambodian participant in the International Visitor Leadership Program initiated and sponsored by the Department of the State of United States of America, which is called this program as the “Youth and Community Conflict Resolution” program. Through RFA, Mr. Tong Soprach has shown the special interest in this program, which has involved 23 countries around the world. He also claimed that it is very constructive, as it has given him a lot of knowledge and experience, which will be useful and practical for his work and the development in Cambodia as well. Next, please listen to the telephone interview conducted by Mr. Taing Sarada, RFA (Washington D.C) with Mr. Tong Soprach (Los Angeles, CA). RFA: How do you do, Mr. Tong Soprach? Soprach: How do you do, Mr Taing Sarada? RFA: Mr. Tong Soprach, Regarding your participation in the leadership program sponsored by the Department of States of America in the last three weeks, what have you learned from this program? Soprach: During these weeks, today is the last week, I have learned many new things, for example, about the “bullying”, and how it becomes the cause of the conflict and violence among youths. It includes many forms such as mocking: curly hairs, white, black, short, Kteuy (LGBT) or calling family name as example. And some mocks online humiliation: Facebook, Twitter, E-mail and so on. These aspects are new program for me and obscure to most people in Cambodia. We just say about it, but there is no specific policy or guideline to deal with these aspects in our country. With this point lead me to think to design as guideline or SOP (Standard Operating Procedures). Here’s in the United States, just Washington of District of Colombia, they created and issued the bullying policy to implement and include into the school curriculum. And all schools under supervision by the district must have the bullying curriculum to address the conflict and violence resulted from bullying. Because in US, there is diversity of ethnicities if they don’t take into account in the earlier, the problem will be increased widely and nationwide. RFA: With this problem if there is any solution on it, how do they deal with the dispute? Soprach: This solution, firstly, they do through youths in schools, they have used what we called the “peer educators” who are smart and volunteer to help their friend. Actually, besides providing the formal education about these aspects, it simply means that they explain their peers as young people’s cohorts about how to solve the conflict. Secondly, in school is not enough, they have youth centers to support wide range of extra-curricular activities that help the teenagers build up their friendship and closeness, which help to lessen the chance of the emergence of conflict and violence. The example of these recreational activities includes create spaces for the planting, sporting, freedom of expression, debating and so on. It means that they try to get young people away from this dispute issue. The solution, they address one-by-one according to each issue with positive way. RFA: Yeah, Mr Soprach, relevant to this leadership program and program of youth conflict resolution you have learned for three weeks; So far, what states have you been to? What are they? Soprach: As scheduled in the program, I have learned five states. They are Washington D.C., New York, Minnesota, Wyoming, Los Angeles of California. RFA: You have experience learning about conflict resolution in the United States as well as many other international delegations who came from different countries. According to those experiences, what is your recommend how to deal with the problems emerging from the conflicts among youths as well as gangs and their activities in Cambodian society? Soprach: This point is strongly related to the elitism in Cambodia. In the United States, most of the wealthy or noble (government officers) parents are concerned with their children’s education and ethic, and therefore, send them to good school as well as be strict with them in term of their social development so that their children use their wealth and prestige to cause trouble in the society. On the contrary, many Cambodian children from rich and noble family (government officers) are often treated indulgently or spoiled by their parents, or their parents do not pay much attention to their children’s education or activities, which has consequences on their social developments and peer relations. They may build up rings of gangs or gang leaders, using their wealth and prestige to recruit the members of the rings. The two activities are different trends or characteristics. In addition, some rich and noble (government officers) Cambodian parents protect their children from law enforcement when they do anything wrong. For instance, when the children cause traffic accident or fight other youths, their parents tend to use their power to help them get away with it as impunity that fuel the injustice in society. In conclusion, education and parental guidance are the main differences between Cambodian and American societies. In the United States, I once asked directly to a police officer for suggestion, you do a good job in addressing the issue in your community but whereas my country as example if the kids of the rich and/or noble government officers do activities as fight other youths or use the car to crash anyone. This violence problem, police officers only arrested them or send to the court, after that these authorities released them freely. What do your suggestion to deal with issue? He (The police officer) answered that only the strong commitment and decision making of the government to reform the court system and improve the enforcement mechanisms can solve the problem and they should get away from any political manner of your leaders. RFA: Mr Soprach, As you may be aware of the issue in Cambodia that the kids of the rich and/or noble government officers who disturb society; sometimes, the police officers are scary of those kids or don’t arrest those kids and/or ignore sometimes their guilt and wrongdoing; example, related to traffic accidents when they ignore when they saw those kids drive SUV Land cruiser or Lexus car passing the stop red light. Around this issue, in your opinion, how does it affect Cambodian society and Cambodian youth? Soprach: Yes, that’s not good role model. In fact, in the United States, the police officers / any authority enforce the law under their territory managements such as city or county level, they can implement well, and no one could interfere in their work through political agenda / economic elitism or nepotism as Cambodia. Here (in the States) Americans are equal under the laws, they arrest all as well as the court. I also asked the judge and attorney, they enforce the laws equally and independently. It is not through the high ranking officials who order to release anyone. This cause a problem in our nation until now. RFA: Now look at the youth involvement in the politics, to what extent that the American youths have their rights and freedom in participating in the political activities that you have learned or observed? Soprach: Relevant to the politic, youth participate through freedom of speech, in the United States, the American youths can express their freedom of expression freely, not just only go to school. They also take part in trying to understand the politic and in expressing their points of view toward the government’s politic and processes of political activities through volunteer, trainings, sports… etc. They seems to have enough capacity to involve in politic, not just learned how to distribute any present the poor as many Cambodian youth do. In here (The States), they have many activities that lead their youth join in develop their community. RFA: Can you compare in social developments for youth in Cambodia and the United States? Soprach: Social development for youth in Cambodia, there are two main points: Firstly, in our country, National Youth Development Policy passed but there is no clear action or enforcement mechanism regarding youths’ social development. In fact, they have what they plan to do on the paper, but they have no tools to make it practical. For example, they planned to create play sites and recreational parks for children, yet secondly all the land scape or state land have been sold out, and almost lakes were filled out for so-called development and investment; especially, Beung Kok lake case and now Tompun lake is on going to fill out. And other state lands were sold out as example, the red soil space around the Olympic stadium where I used to play football when I was a boy, now sold out. Therefore, youth start not to have no place to play sports or recreational activities, they are highly likely to be involved in any wrongdoing/illegal activities or the rings of gang and getting worse and crime. This opposes to the United States, I found out two important places; as example, firstly in New York even densely populated area, but they try to create sport fields: Baseball pitch, soccer pitch and basketball for their young people play. Secondly, in Minnesota state, Minneapolis city keeps big lakes, in which young people can gather and enjoy swimming and rowing. This condition allows peer education and idea sharing, and thus improves their social development. I am here and aware of the two different nations. RFA: Thank you, Mr. Tong Soprach, for your time with RFA. Soprach: Yes, Thank you. Mr. Taing Sarada.